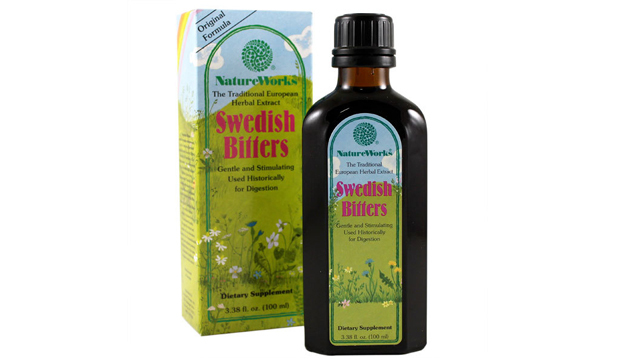 Swedish Bitters is basically a mix of 11 herbs, each having its own medicinal and curative properties. The 400 year-old herbal recipe, which has stood the test of time, took herbalism to new heights after it was popularized in the late 20th century. Swedish Bitters is a herbal drink prepared by mixing medicinal herbs in alcohol. It was originally formulated to relieve indigestion. The herbal ingredients, mixed in the right proportion, form an excellent tonic for the liver, kidney and gall bladder. The herbal formula is said to stimulate bile and other enzymes required for digestion of fat and animal products. It is also known to boost the immune system and hormonal functions. The preparation can be used as a mouthwash and for external applications in the form of cream or tincture. The ingredients are mixed with 1.5 liters of rye or fruit spirit (38-40 percent concentration) in a wide-necked bottle or jar of two-liter capacity. Alternatively, the alcohol concentration can be obtained by pouring a solution of Everclear alcohol and water in the ratio 2:3 over the ingredient mixture. The jar is covered with an air-tight lid and allowed to stand in the sun or near the stove for 14 days. It must be shaken daily to ensure proper extraction. After the 14-day period, the liquid is strained and stored in small stoppered bottles in a cool place. Otherwise, the liquid can be stored indefinitely and strained as and when required. The herbal ingredients can also be used in the form of tea if you want an alcohol-free preparation. This is done by mixing one teaspoon of the dried herbs (containing the ingredients in the right proportion) with three cups of boiling water, cooling it and storing it in the refrigerator. You can mix two tablespoons of the extract to a cup of boiling water to make your drink. The quantities of ingredients used in the formula can be adjusted to suit individual needs. For example, Aloe is known to stimulate uterine contraction, meaning that pregnant women must reduce the dose. Aloe is secreted in mother’s milk, so feeding mothers must exercise discretion to prevent diarrhea in babies. People suffering from irritable bowel syndromes can reduce their dosage of herbs like aloe and senna that have a purgative effect. Symptoms of overdose are sleepiness and tenderness in the stomach. Herbalist Maria Treben’s book “Health through God’s Pharmacy” suggests a prophylactic intake of one teaspoon diluted with water in the morning and evening. It recommends three tablespoons diluted in water for any kind of sickness. For those with serious sicknesses, the book recommends diluting one tablespoon with half a cup of herb tea, sipping half of it 30 minutes before each meal and the other half 30 minutes after each meal. If you prefer one dose per day, it is apt to have it after your evening meal. People who are highly responsive to the formula can restrict their dosage to four to five drops in the morning and evening. When taken as a tonic, i.e. as a maintenance dose after achieving the desired health results, the recommended dose is once every four days. For those who prefer the Swedish Bitters tea, a twice-a-day dose is recommended, but it is good to exercise discretion as the Swedish Bitter Tea is a strong drink. For external applications, the formula can be dabbed on to the affected region and allowed to dry so that it does not stain clothes. Alternatively, a compress made by soaking cotton or flannel in tincture can be applied over the affected area. In that case, it is advisable to place a plastic sheet over the cloth and bandage in order to prevent staining of clothes. In the cream form, the preparation can be used as a facemask or scrub.